Woodside Wildlife Park Lincolnshire - Tiger Rescue. Rescued from a European circus by concerned authorities, Woodside stepped in at the 11th hour and successfully managed to give these magnificent animals a safe, secure and long term home. 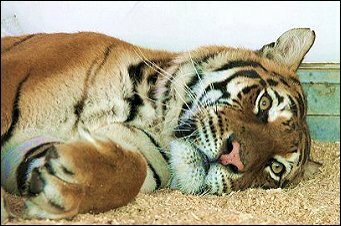 The pair of male and female tigers were both very badly treated in captivity by their previous owners. The female tigress behind bars at the Circus. Waiting in temporary accomodation in Belgium before travelling to her new home at Woodside. 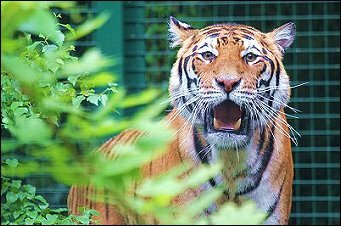 Here at Woodside, we spent six months building a brand new purpose built enclosure for our rescued tigers. This has enabled us to provide a new home for them and give these beautiful animals the necessary care they require. 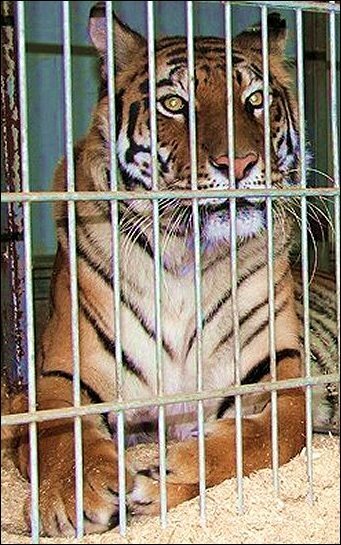 The cost of rescuing these tigers from the European authorities, transporting them over to the UK and constructing the purpose built enclosure has been significant; as will be the costs of providing continuous care in future... but we very much wish to finally give these poor tigers the quality of life they so deserve. Can you help us to care for the tigers?